NICI-Mania's Jolly Mah will be showing you A1 Bak Kut Teh in this post. Special guest appearance by NICI snow reindeer! 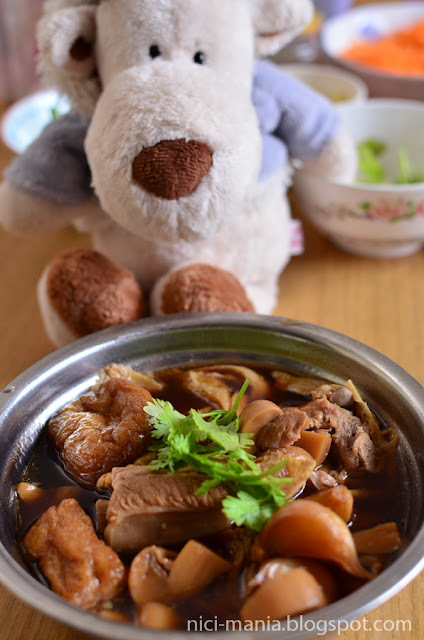 Bak Kut Teh is pork ribs soup with a distinctive taste of local spices. 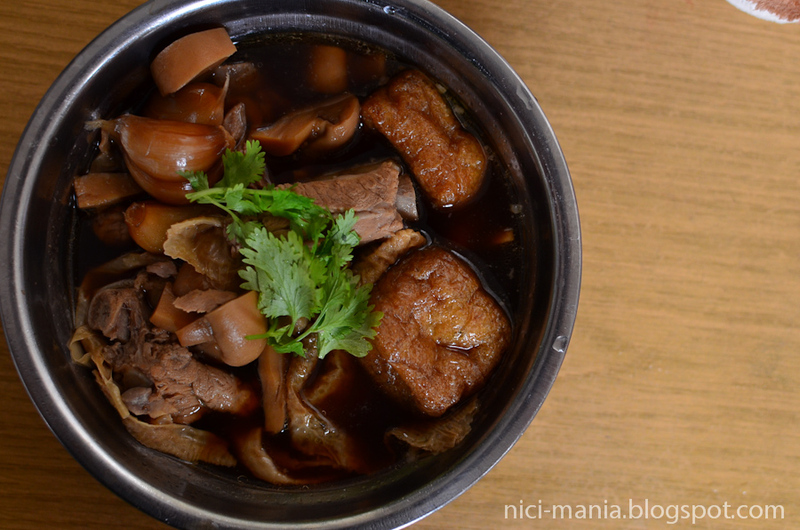 Bak Kut Teh is the most famous classic dish here, a must eat delicacy if you ever visit Malaysia. 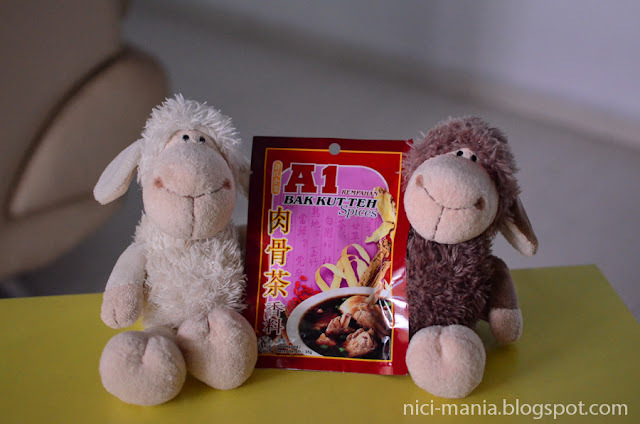 A1 Bak Kut Teh combines all the important spices for the unique Bak Kut Teh taste and puts it in a convenient pack so you can easily cook your own Bak Kut Teh at the comfort of your own home. 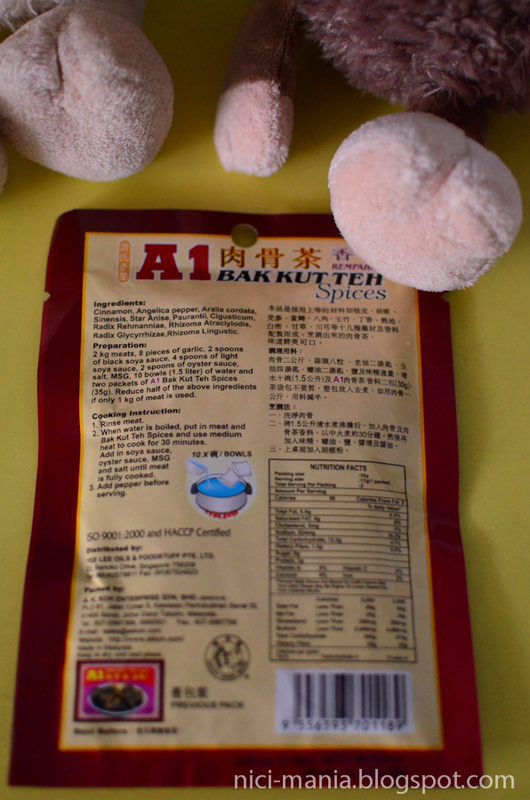 A1 Bak Kut Teh comes in two packets of spices as you can see above. Put both into one pot of soup. Prime pork ribs is the preferred type of ribs for Bak Kut Teh. 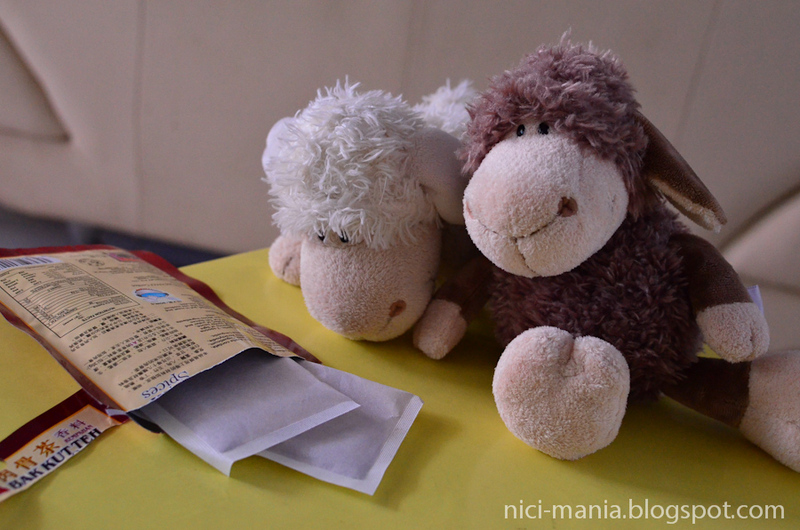 They are very soft and tender when cooked. The instruction says 2kg of meat but 8 pieces of prime pork ribs would be enough. 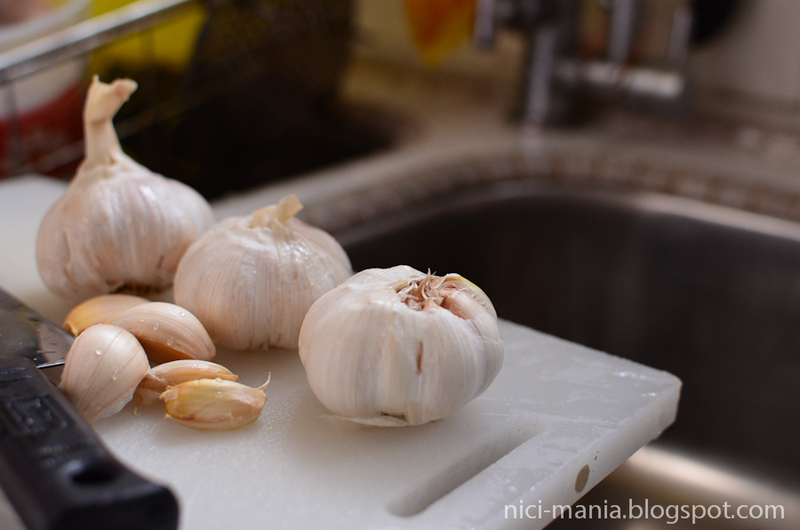 Garlic is the next most important ingredient for the Bak Kut Teh soup taste. We put 2 generous bulbs of garlic (unpeeled) into the soup and chop up 1 extra bulb for condiments later. 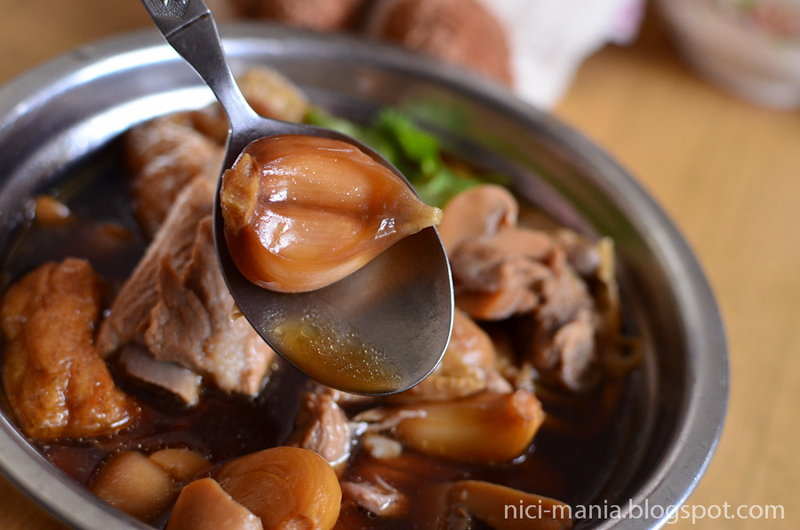 Button mushrooms are optional but we love to have them in our Bak Kut Teh. Fried bean curd skin is also optional here. 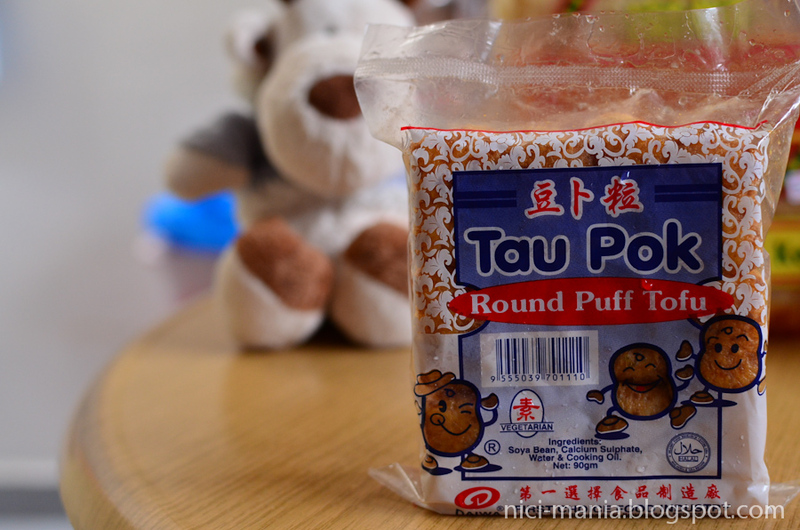 Fried tofu puff is also optional here. 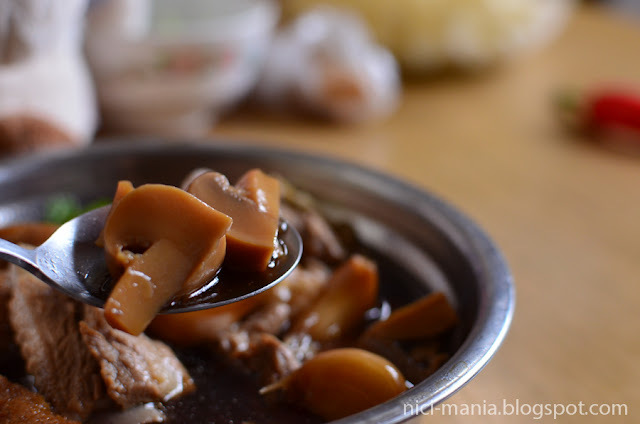 Some popular extra ingredients Bak Kut Teh stall owners like to put here is pork liver and pork intestine. 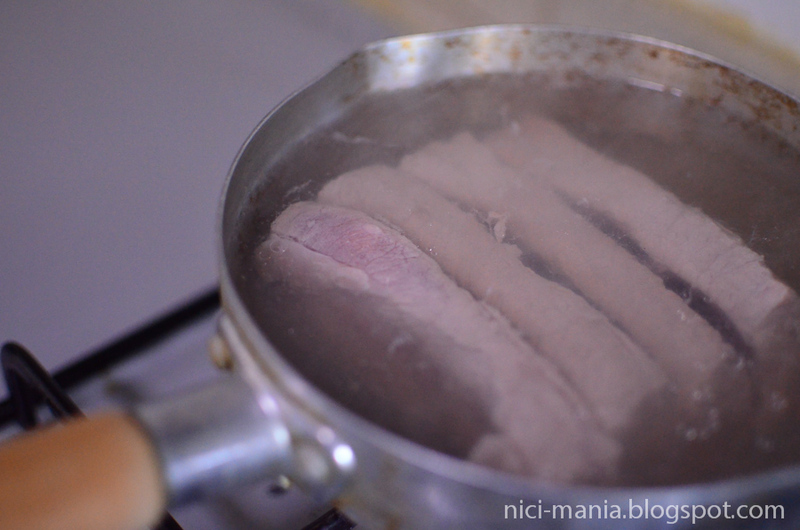 Always boil the pork ribs in a separate small pot first as you can boil away all the dirty blood in the ribs. Very important so that your soup won't be tarnished. 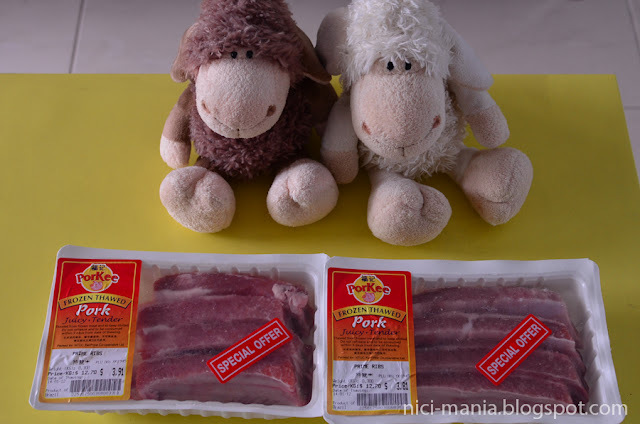 We used about 1 litre of water here and then we dump the ribs, garlic, button mushrooms and A1 Bak Kut Teh pack into the soup all at once. 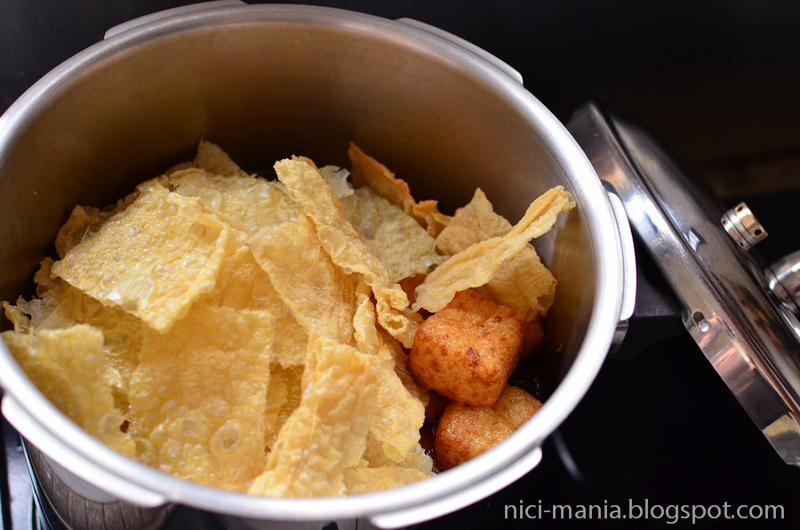 The optional bean curd skin and tofu puff can be added anytime but we add it almost when its ready. 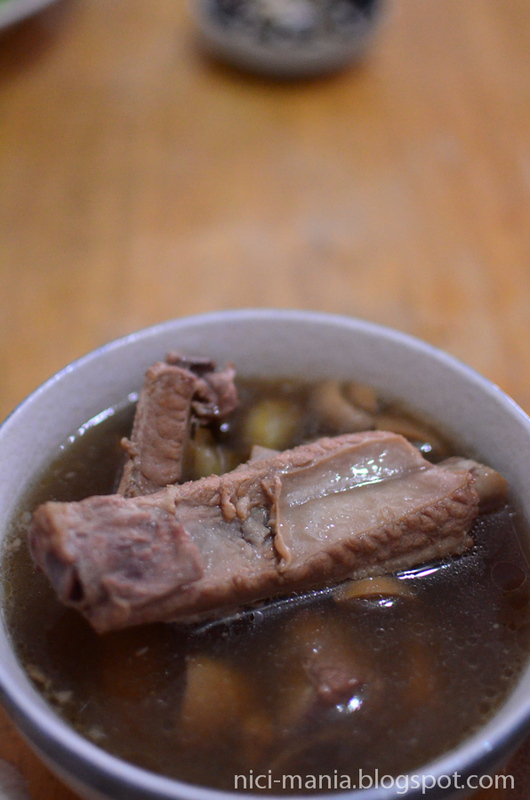 After boiling for 1.5hours, the A1 Bak Kut Teh soup is done! All you need to do is add salt to taste and MSG (food flavoring to enhance the flavor), but we used chicken stock cubes to replace MSG. We also added lots of pepper, it is not mandatory to add all the dark/light soy sauce and oyster sauce as mentioned in the instructions. 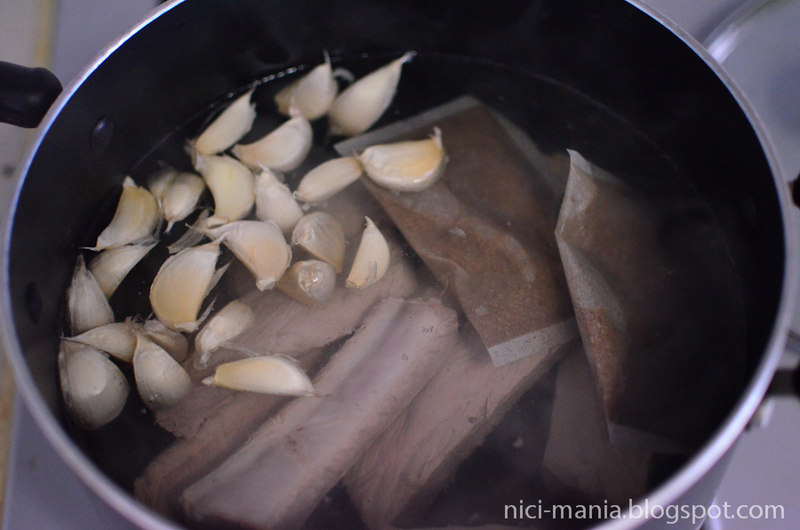 The garlic is well soaked with all the A1 Bak Kut Teh spices and pork ribs taste. 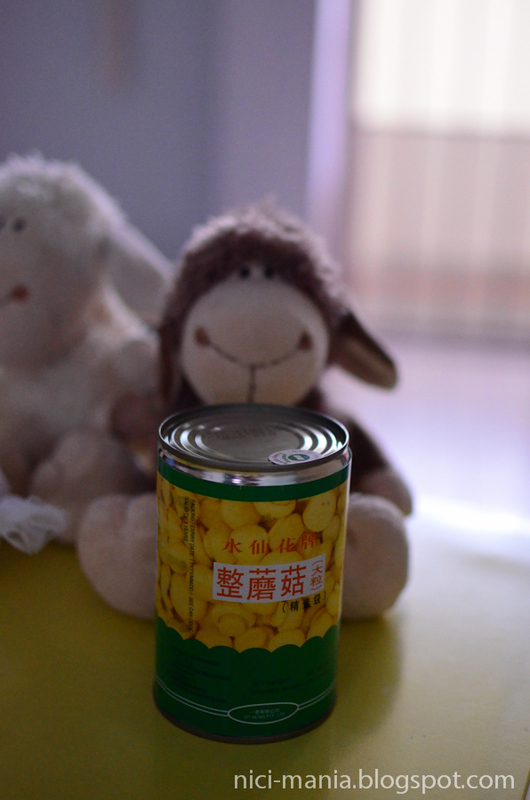 The button mushrooms are also very tasty. 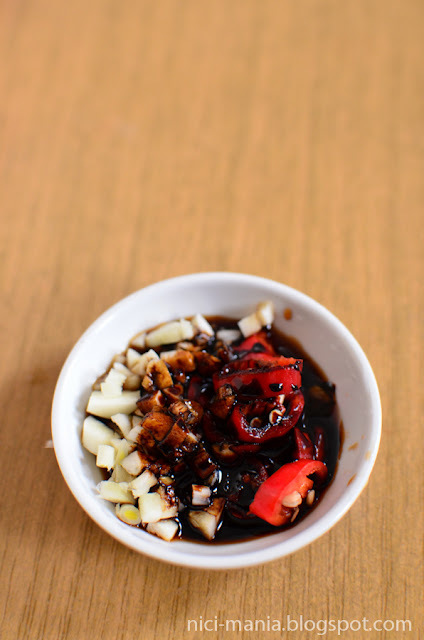 The most important condiment to go with Bak Kut Teh is this chopped fresh garlic with red chilli in dark soy sauce + light soy sauce. 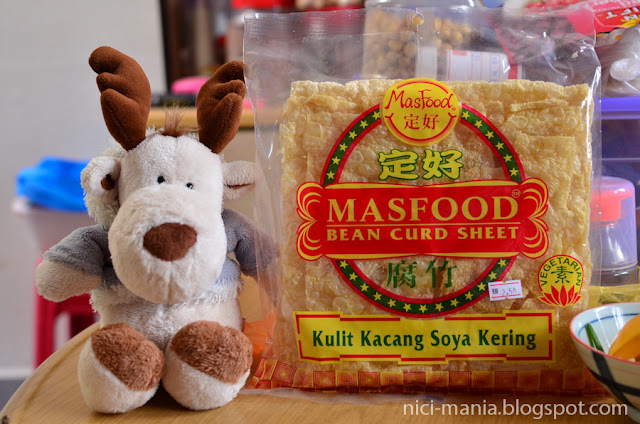 This goes very very well with the pork ribs in the Bak Kut Teh soup. Not compulsory but most shops selling Bak Kut Teh gives this. 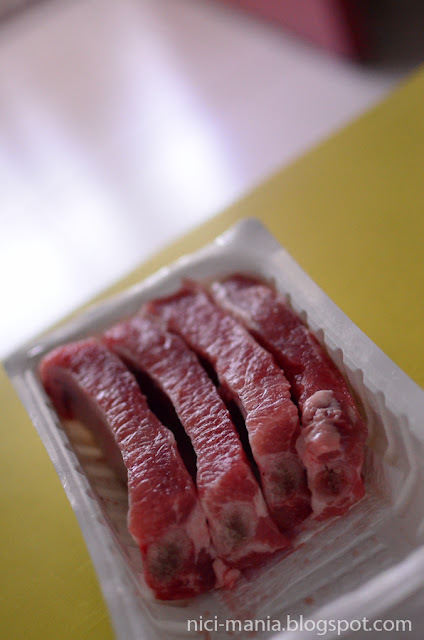 How do you know when the prime pork ribs is well cooked? As long as the meat tears away from the bone easily means the ribs are tender and succulent.